Water Wells and Boreholes provides the necessary scientific background together with practical advice using global case studies, in an accessible easy to use style suitable for both postgraduates/researchers and practitioners. The book begins with an introduction to the type and uses of water wells from water supply and irrigation through to groundwater remediation. It then covers well siting detailing how to source data from geophysical surveys, remote sensing etc. Well design is then summarised to ensure the well is stable and cost-effective. The book ends with three chapters covering well construction, well testing and well performance, maintenance and rehabilitation. 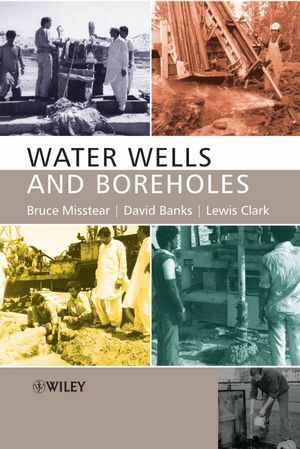 Between them, the three authors (Bruce Misstear, David Banks, Lewis Clark)have worked extensively on groundwater projects in Europe, Africa, Middle East and Asia, and this international experience is reflected in the text and illustrations of this new book on Water Wells and Boreholes. Regarding previous publications, in brief, the three authors have "published widely on issues ranging from well design and testing, to the hydrogeology of hard-rock aquifers, to groundwater contamination investigation".